Edward of Westminster, Prince of Wales. Edward of Westminster, or Edward of Lancaster, as he is sometimes known, the only son of King Henry VI and Queen Margaret of Anjou was born at the Palace of Westminster, London on 13 October, 1453. At the time of Edward's birth, Richard Plantagenet, Duke of York, who had a slightly superior claim to the throne than the Lancastrian line, had challenged the authority of Henry's officers of state. Henry VI exhibited signs of serious mental illness, that prevented him from governing the kingdom. Prior to Edward's birth, in 1453, at the age of 32, by means of a "sudden fright" he entered into a trance-like state reacting to and recognising no one. Catatonic schizophrenia or depressive stupor have been suggested as a likely diagnosis. Rumours abounded, fed by the Yorkist faction, that the child was not the feeble minded king's but Somerset's, all of which threw more fuel on the fires of discontent. Queen Margaret, "a strong laboured woman", was fiercely protective of her son and his rights. Henry eventually recovered his senses and when showed his son, declared himself pleased and enquired about the child's godfathers. Adding to existing doubts about the child's paternity, he declared that Edward must have been fathered by the Holy Ghost. There were widespread rumors that the prince was the result of an affair between the Queen and one of her loyal supporters. Edmund Beaufort, 1st Duke of Somerset, and James Butler, Earl of Wiltshire, were both suspected of fathering Prince Edward, however, there is no firm evidence to support the rumours, and Henry himself never doubted the child's legitimacy and publicly acknowledged paternity. Edward was invested as Prince of Wales at Windsor Castle in 1454. 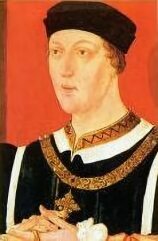 In 1460, King Henry VI was captured by the Yorkists at the Battle of Northampton and taken to London as their prisoner. The Duke of York was appointed Protector of England. Margaret, true to character, was not going to accept this meekly. She gathered an army to advance her son's cause and York, Salisbury and Warwick were forced into flight before her. York returned from exile and laid formal claim to the throne. When asked why he had not previously done so, he responded that "though right for a time lies silent, yet it rotteth not, nor shall it perish." A compromise was agreed on, whereupon by the Act of Accord, Henry VI was to keep the throne for the remainder of his lifetime but the succession was to go to York and his heirs. No one for a moment expected that the spirited Margaret would accept the disinheriting of her son meekly and this proved to be the case. Margaret and Edward had meanwhile fled through Cheshire. 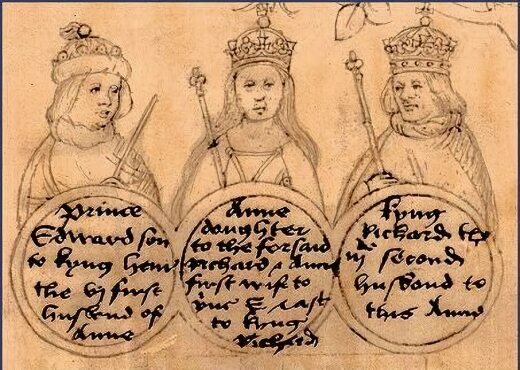 By Margaret's later account, she induced outlaws and pillagers to aid her by pledging them to recognise the seven-year-old Edward as rightful heir to the crown. They subsequently reached safety in Wales and travelled on to refuge in Scotland, where Margaret raised support for her son's cause, while York's enemies gathered in the north of England. After York was slain at the Battle of Wakefield, the large army which Margaret had gathered advanced south. They defeated the army of Richard Neville, Earl of Warwick, York's nephew, at the Second Battle of St Albans. Warwick brought the captive King Henry in the train of his army, and he was found abandoned on the battlefield. Two of Warwick's knights, William Bonville, 1st Baron Bonville, and Sir Thomas Kyriell, who had agreed in good faith to remain with Henry and see that no harm came to him, were taken prisoner. The day after the battle, Margaret enquired of Edward as to what fate the two knights should suffer. The seven year old Edward readily replied that their heads should be cut off. Margaret advanced on London but the Londoners, alarmed by news of the Lancastrian army's pillaging, refused to admit her and she subsequently retreated. York's son, (who had been declared Edward IV soon after his father's death) defeated a Lancastrian army at Towton a few weeks later, in a bitter blood bath. Margaret and Edward fled to Scotland again and after remaining there for three years, was forced to set sail to France, where she and Edward maintained a court in exile. In 1467 the ambassador of the Duchy of Milan to the court of France wrote that Edward "already talks of nothing but cutting off heads or making war, as if he had everything in his hands or was the god of battle or the peaceful occupant of that throne." 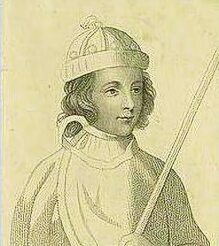 After they had spent several years in exile, a major rift between Edward and his erstwhile ally, the powerful Richard Neville, known as 'Warwick the Kingmaker' forced Warwick to flee to France. In a subtle stroke of diplomacy, Louis XI of France, known as the Spider, reconciled the discontented Warwick with the Lancastrian queen, no mean feat, since they were bitter enemies and Margaret had executed Warwick's father, Salisbury. Warwick is reported to have spent hours on his knees before Margaret would consent to the alliance. His younger daughter, Anne Neville, was formally betrothed to Edward of Lancaster at the Château d'Amboise in France. As a compliment to his new allies, Louis made Edward godfather to his son Charles. Edward was married to Anne Neville at Angers Cathedral, probably on 13 December 1470. Warwick duly invaded England on Margaret's behalf in 1470, resulting in the flight of Edward IV to Burgundy and the release of Henry VI from the Tower of London and his brief re-instatement as king. A sad and pitiful figure, he was paraded through the streets of London in a shabby blue gown by George Neville, Archbishop of York and set up as a puppet King, whom the ambitious Warwick ruled through. Margaret and Edward set sail for England on 24th March and landed the day the Battle of Barnet was fought to learn the disastrous news of Warwick's defeat and death. She marched her forces to join with the Lancastrians in Wales, led by Jasper Tudor, the half-brother of Henry VI, with Edward IV, aware that he must strike swiftly to contain the threat, in pursuit. On 3rd May, a very hot day, the weary Lancastrian forces pitched camp for the night at Tewkesbury. King Edward forced his army on in attempt to halt Margaret's progress before she reached Wales and reinforcements, finally stopping some 3 miles from the Lancastrians forcing them to meet him in battle. The eighteen year old Edward, was killed either in the resulting battle or during its aftermath. There are several conflicting versions concerning how Prince Edward met his end, one states he was cut down as he fled north in the aftermath of the battle, another states that following the rout of the Lancastrians, a small contingent of men under the Duke of Clarence found Edward near a grove, where he was immediately beheaded on a makeshift block, despite pleas for mercy to his brother-in-law Clarence. An alternative version was given by three other sources: The Great Chronicle of London, Polydore Vergil and Edward Hall, which was the version used by Shakespeare. 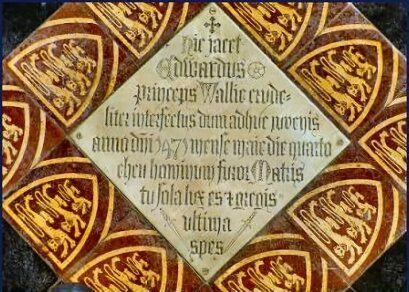 This records, that Edward, having survived the battle, was taken captive and brought before King Edward IV who was with George, Duke of Clarence; Richard, Duke of Gloucester; and William, Lord Hastings. The king received the prince graciously, and asked why he had taken up arms against him. The prince replied proudly and defiantly, "I came to recover my father's heritage." The king then struck the prince across his face with his gauntlet hand and those present with the king then suddenly stabbed Prince Edward with their swords. Prince Edward was buried at Tewkesbury Abbey. Queen Margaret, defeated at last by the death of the son she had fought so long and hard for, was taken captive by William Stanley at the end of the battle and imprisoned. 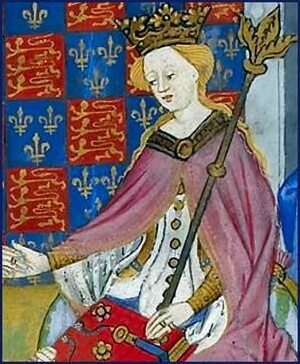 His widow, Anne Neville, was remarried to Edward IV's youngest bother, Richard, Duke of Gloucester, later Richard III.